In the months after September 11, 2001, it was regularly said that “everything” had changed. It’s a claim long forgotten, buried in everyday American life. Still, if you think about it, in the decade-plus that followed—the years of the PATRIOT Act, “enhanced interrogation techniques,” “black sites,” robot assassination campaigns, extraordinary renditions, the Abu Ghraib photos, the Global War on Terror and the first cyberwar in history—much did change in ways that should still stun us. Perhaps nothing changed more than the American national security state, which, spurred on by 9/11 and the open congressional purse strings that followed, grew in ways that would have been alien even at the height of the Cold War, when there was another giant, nuclear-armed imperial power on planet Earth. Unfortunately, the language we use to describe the world of the national security state is still largely stuck in the pre-9/11 era. No wonder, for example, it’s hard to begin to grasp the staggering size and changing nature of the world of secret surveillance that Edward Snowden’s recent revelations have allowed us a peek at. If there are no words available to capture the world that is watching us, all of us, we’ve got a problem. In ancient China, when a new dynasty came to power, it would perform a ceremony called “the rectification of names.” The idea was that the previous dynasty had, in part, fallen because a gap, a chasm, an abyss, had opened between reality and the names available to describe it. Consider this dispatch, then, a first attempt to “rectify” American names in the era of the ascendant national—morphing into global—security state. Creating a new dictionary of terms is, of course, an awesome undertaking. From the moment work began, it famously took seventy-one years for the full ten-volume Oxford English Dictionary to first appear! So we at TomDispatch expect to be at work on our new project for years to come. Here, however, is an initial glimpse at a modest selection of our newly rectified definitions. Leak: Information homegrown terrorists slip to journalists to undermine the American way of life and aid and abet the enemy. A recent example would be the National Security Agency (NSA) documents Booz Allen employee Edward Snowden leaked to the media. 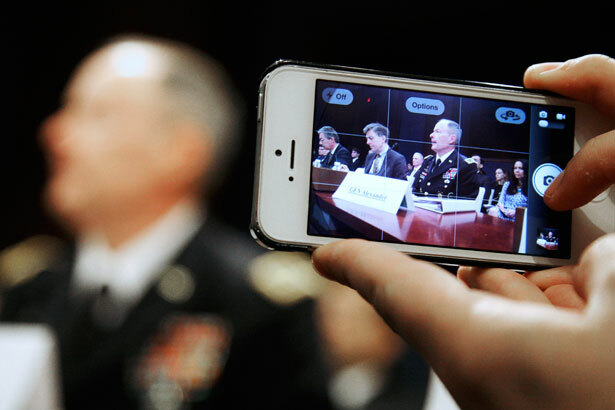 According to two unnamed US intelligence officials speaking to the Associated Press, “[M]embers of virtually every terrorist group, including core al-Qaida, are attempting to change how they communicate, based on what they are reading in the media [of Snowden’s revelations], to hide from US surveillance.” A clarification: two anonymous intelligence officials communicating obviously secret material to AP reporter Kimberly Dozier does not qualify as a “leak,” but as necessary information for Americans to absorb. In addition, those officials undoubtedly had further secret intelligence indicating that their information, unlike Snowden’s, would be read only by Americans and ignored by Al Qaeda–style terrorists who will not change their actions based on it. As a result, this cannot qualify as aiding or abetting the enemy. Journalist: Someone who aids and abets terrorists, traitors, defectors and betrayers hidden within our government as they work to accomplish their grand plan to undermine the security of the country. Source: Someone who tells a journalist what no one, other than the NSA, the CIA, the Defense Intelligence Agency, the FBI, the Department of Homeland Security and similar outfits, should know (see “secret”). Such a source will be hunted down and prosecuted to the full extent of the law—or beyond (see “Espionage Act”). Fortunately, as Associated Press president Gary Pruitt recently pointed out, thanks to diligent government action, sources are drying up. (“Some of our longtime trusted sources have become nervous and anxious about talking to us, even on stories that aren’t about national security. And in some cases, government employees that we once checked in with regularly will no longer speak to us by phone, and some are reluctant to meet in person.”) Someday, they may no longer exist. When an unnamed administration official offers information privately to a journalist, however, he or she is not a source—just too humble to take credit for feeding us crucial information needed to understand the complex world we live in. Blood: This is what leakers have on their hands. A leak, embarrassing the national security state, endangers careers (bloody enough) and, by definition, American lives. Thus, Bradley Manning, in releasing classified State Department and US military documents to WikiLeaks, and Edward Snowden, in releasing NSA secrets to The Guardian, The Washington Post, theSouth China Morning Post and Der Spiegel have blood on their hands. We know this because top US officials have told us so. Note that it does not matter if no deaths or physical injuries can directly be traced to or attributed to their actions. This is, however, a phrase with very specific and limited application. American political and military officials who launch aggressive wars, allow torture, kidnapping and abuse, run drone assassination programs and the like do not have blood on their hands. It is well known that they are bloodless. US Constitution: A revered piece of paper that no one pays much actual attention to any more, especially if it interferes with American safety from terrorism. Amendments: Retrospectively unnecessary additions to the US Constitution guaranteeing a series of things, some of which may now put us in peril (examples: First Amendment, Fourth Amendment, Fifth Amendment “due process” clause). Fortunately, amendments turn out to be easy enough to amend within the national security state itself. The fourth branch of government: Classically, the US had three branches of government (the executive, legislative and judicial), which were to check and balance one another so that power would never become centralized in a single place unopposed. The Founding Fathers, however, were less farsighted than many give them credit for. They hadn’t a clue that a fourth branch of government would arise, dedicated to the centralization of power in an atmosphere of total secrecy: the national (or today global) security state. In the post-9/11 years, it has significantly absorbed the other three branches. FISA court: The Foreign Intelligence Surveillance Act of 1978, much strengthened since September 11, 2001, created a FISA “court” to oversee the government’s covert surveillance activities. A secret “court” for the secret world of surveillance, it can, at just about any time, be convened and conducted via cell phone by the NSA or FBI. There is never a defense lawyer present, only the equivalent of a prosecution request. The search warrants that result read more like legislation by an unelected body. All national security requests for such warrants are granted. Its decisions are not made public. In its arcane rules and prosecutorial stance, it bears a greater relationship to the Inquisition courts of Medieval Europe than any other American court. Its motto might be, “guilty—there are no innocents.” We have no word for what it actually is. The activity it performs is still called “judicial oversight,” but “undersight” would be a more accurate description. National Security Agency (NSA): A top-secret spy outfit once nicknamed “No Such Agency” because its very existence was not acknowledged by the US government. It is now known as “No Such Agency” because its work has been outsourced to high-priced high-school dropouts, or “No Snowden Anywhere” because it couldn’t locate the world’s most famous leaker. American security (or safety): The national security state works hard to offer its citizens a guarantee of safety from the nightmare of terror attacks, which since 9/11 have harmed far more Americans than shark attacks, but not much else that is truly dangerous to the public. For this guarantee, there is, of course, a necessary price to be paid. You, the citizen and taxpayer, must fund your own safety from terrorism (to the tune of trillions of dollars heading into the national security budget) and cede rights that were previously yours. You must, for instance, allow yourself to be “seen” in myriad ways by the national security state, must allow for the possibility that you could be assassinated without “due process” to keep this country safe, and so on. This is called “striking a balance” between American liberty and security. Or as the president put it, “You can’t have 100 percent security and also then have 100 percent privacy and zero inconvenience… We’re going to have to make some choices as a society… There are trade-offs involved.” By the way, in return for your pliancy, this guarantee does not extend to keeping you safe from cars, guns, cigarettes, food-borne diseases, natural disasters of any sort and so on. What was going through Edward Snowden’s mind as he flew from Hawaii to Hong Kong? Fellow-whistleblower Peter Van Buren has some ideas.